Since 2013, much of our effort has focused on documenting the progression of sea star wasting syndrome (SSWS) along the West Coast of North America and across a range of sea star species. That effort continues, however, we are now moving into a new phase in the assessment of sea star wasting: the ecological consequences from the loss of these species. Because (1) many of the affected species are predators, (2) sea stars, generally, are not typical prey for other species and (3) prior to the wasting event sea stars were often abundant, there could be a population release for those species that were prey for sea stars. This could lead to significant changes in the ecological communities where sea stars have been affected. Such effects could intensify and persist until sea star populations are replenished. Key to the assessment of the ecological consequences is an understanding of the potential for population replenishment of sea stars. Replenishment will most likely come from new individuals that recruit as larvae to sites along the coast. We have seen evidence of substantial recruitment of new sea stars (babies) in a few areas that have been severely affected by wasting. This could be a signal that replenishment of affected populations may be more rapid than expected. This will only be true if recruitment is geographically broad and intense and if the resulting juvenile sea stars are themselves relatively unaffected by wasting. Our teams, along with those of our collaborators, are carefully monitoring recruitment at sites we study, but it is clear that citizen observations will be important (as they have been in the documentation of the progression of wasting) in documenting recruitment along the west coast. We encourage you to submit your observations of healthy and/or diseased juvenile stars using our Sea Star Wasting Syndrome Observation Log. Your contributions will greatly assist the effort to fully understand the impact of and recovery from sea star wasting. We have created a juvenile sea star identification guide to assist with proper identification; however submitting photos is also highly encouraged. 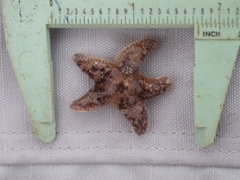 Some things to note when making observations: (1) juveniles of different sea star species can look very similar to one another, particularly the ochre star, Pisaster ochraceus and the mottled star, Evasterias troschelii. The 6 armed star, Leptasterias spp., can also look similar to these species as an adult, so it is important to look carefully for the features described in our identification guide. If you are not certain of a species’ identification, please use the “unknown” category, rather than guessing.